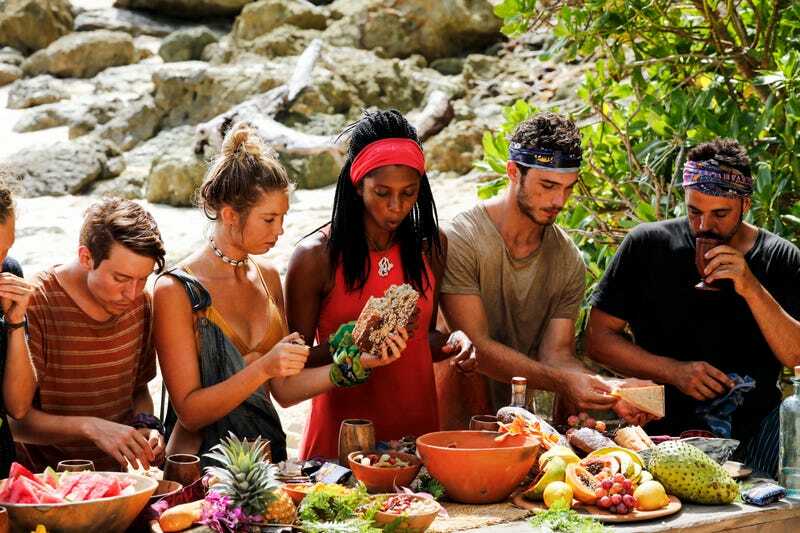 The merge can reinvigorate even a lackluster season like Ghost Island. In theory, three tribes coming together provides for limitless strategic possibilities and high levels of uncertainty or even chaos. In practice, it would be easy enough for the original Naviti members to stick together and bounce the remaining Malolos in boring fashion. Let’s see if Bradley’s ouster helps prevent the latter from happening. The tribes converge at Naviti beach and the usual feast awaits. Chris finds a note in his buff, leading to a clue to yet another advantage. The catch is that he’ll have to take a secret ride out to Ghost Island to claim it. Wendell wants an “easy peasy Naviti” vote and tries to broker a truce between Dom and Chris. Chris isn’t so sure he’s down with it and won’t commit to anything. He’s too “suave-ay” to buy it. Also he raps, and it is crap. Chris slips out of camp unnoticed and hitches a ride to Ghost Island. This is kind of cool, actually. Waiting for him is JT’s immunity idol from Game Changers. Shot of Michaela sipping tea! This idol is only good for the next tribal, but he can extend it by choosing the correct bamboo. He extends it by one, then gets a “NO VOTE” note, meaning he can’t vote at the next tribal. I have seriously lost track of how many advantages are currently floating around the game. It’s ridiculous. The Dom/Chris war is heating up. Chris is such a doof, but that may work in his favor if enough players view him as dangerous. I don’t know who knows Dom has a real idol and who knows about the fake one at this point. The look on Wendell’s face during Chris’s latest rap is priceless. Individual immunity is up for grabs! It’s a balancing deal, holding up a tiki statue on a pole while standing on a beam. Dom and Chris both drop out before the end, with three women making it to the last round. I’m not sure any of them are in any danger, but Kellyn snags the necklace. The new tribe is named Lavita, I guess. Not even Lavita Loca? Chris takes everyone but Dom and Wendell to the well to discuss a split vote. Donathan fills Dom in on this plan. Wendell makes a pitch for getting Chris out. (I’m not sure how he’s hiding his immunity idol, since it’s Erik’s necklace from Fans vs. Favorites. Maybe he only needs a portion of it?) Four ex-Naviti women are still interested in taking out an original Malolo. Desiree wants Libby gone. The situation is very fluid right now. Chris has never been to tribal council! I had no clue. Dom gives his side of the feud and pulls out his fake idol. Chris talks up his leadership qualities at Probst’s instigation. A lot of people are trusting their gut. Chris casts his no-vote. Dom makes no bones about his vote for Chris. Wendell tells him he’s trash at rapping. Dom plays the legacy advantage. Wendell doesn’t play his idol. Libby gets two votes, but the rest go to Chris, who is one and done at tribal council. That was fun, but honestly, I was kind of hoping the rivalry would be extended another episode or two. This would seem to open things up for the rest of the game, though. I hope! Next week: the return of the gross food eating challenge!